It&apos;s all in the name. 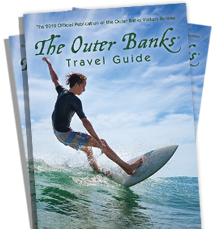 The village of Waves in the Outer Banks was called South Rodanthe during the 1930&apos;s until the town got its own post office and its new name reflecting the Atlantic Ocean’s influence on the tiny North Carolina community. The area is a haven for water sports like kiteboarding and windsurfing, bird watchers will love the proximity to the Pea Island National Wildlife Refuge and access to the sounds is terrific for fishermen and beach lovers alike. Today, the village is dotted by gorgeous beach cottages, rental condos and things to do, but the influence of history is still apparent to anyone who vacations here. The front seat to nature afforded on the edge of the continent has birthed a culture of harnessing the elements for fun. There&apos;s no better place than REAL Watersports to hone your passions for kiteboarding, surfing, kitesurfing and SUP. 4x4 driving, beach combing, Triple-S Invitational in June are just a few ways to pass your time will on vacation.